Seeing is Believing This sample manual to teach Managing Pressure and Maintaining Balance is in MS Word format. Managing Pressure and Maintaining Balance is the ideal course for trainers to offer to hectic workplaces (and today, whose isn't?!). 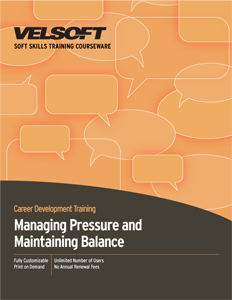 This complete suite of training materials includes exercises to help recognizes pressures specific to a workplace, to identify what interventions can take place, to come from a place of emotional intelligence and validation, while offering strategies for communicating, setting goals, and more. This one-day interactive course includes a pre-assignment, detailed instructor guide, student guide, pre- and post-assessments, quick reference guide and more. If your students like to learn from their mobile devices, ask about our blended learning (www.velsoftcourseware.com).